Its everything coffee at SM as SM Center Lemery celebrates coffee festival this September. 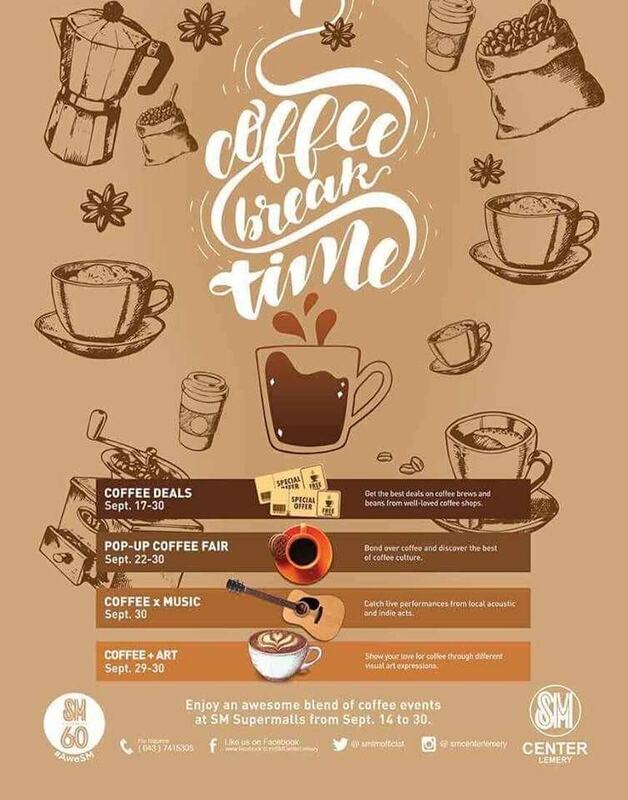 From September 17 – 30, savor the delightful flavor and aroma of coffee at the Pop Up Coffee Fair of SM Center Lemery and get a taste of newly brewed coffee from their participating coffee shops in the mall. On September 30, chill out and listen to some soulful music from local acoustic band while sipping your choice of hot or cold coffee. Celebrate your love for coffee, visit the Pop Up Coffee Fair of SM Center Lemery located at ground floor near Banco De Oro. Showcase of Coffee Painting Exhibit featuring local artist group, Grupo Sining Batangueno.